Exklusiv Stöckli Skis for rent. Free ski storage on the piste. A Backnumber? Certainly aren´t the quality models of INTERSPORT Ferienart Sport & Fashion! 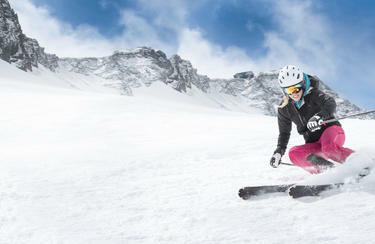 Brand-new material and favorable conditions characterize the ski rental in Saas-Fee. Professional advice you can expect at INTERSPORT Rent. Our ski experts will not only help you in choosing the proper equipment, but also inform you about safety and individual driving techniques. Get valuable tips and discover interesting aspects of Saas-Fee. Take advantage of the practical OVERNIGHT service at INTERSPORT Ferienart Sport & Fashion. Whether waxing and polishing, edge tuning or repairing of covering: The next skiing day you are back on the run safely and enjoy a much better ride. On freshly groomed skis or board, turns and spins are much more easier. Just wait and see! Alle Mitarbeiter waren sehr kompetent, freundlich und super vorbereitet. Der gemietete Ski war der Beste, den ich je unter meinen Füssen hatte. Das uns auch noch gleich das Depot für Schuhe und Skis zur Verfügung gestellt wurde, hat uns überrascht, aber wir waren auch da begeistert vom Service. Es gibt gar keinen Zweifel: wir kommen wieder!